We woke up the morning after exploring Animal Kingdom and Pandora a little more rested. 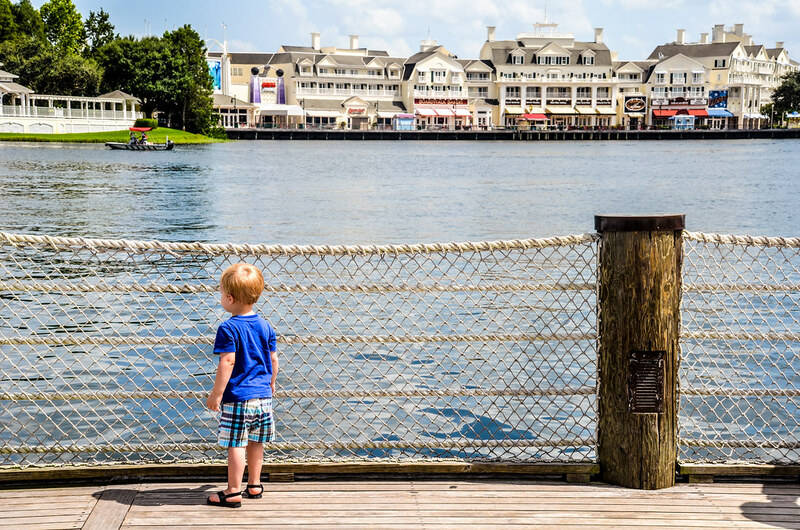 Most of our Disney trips are taken at a more leisurely pace than many. We both enjoy that pace a little more and are afforded that benefit because we travel to Disney Parks often. So far this trip we had been going non-stop in the midst of very hot weather. Sleeping in was nice. In late morning we checked out of Coronado Springs, left our bags at bell services for them to transfer to our next hotel and headed to Hollywood Studios. That afternoon we were set to check in at the Yacht Club for two nights and had the deluxe dining plan linked to that reservation. I’ll have a full post regarding that plan in the next few weeks but for the sake of this post that plan just meant that we were going to eat a ridiculous amount of food over the next three days. That ridiculous amount started at Sci-Fi Dine Inn Theater. We were largely disappointed by Sci-Fi, as we didn’t enjoy our food very much. To read our full review, click here. Part of the problem was the time we ate our lunch. Eating a 3-course meal of incredibly heavy food an hour and a half after waking up isn’t the brightest idea. Still, outside of the beautiful atmosphere this was a disappointing start to the day. After our lackluster meal we raced over to Indiana Jones Stunt Spectacular. We had both wanted to see this show again, as it had been quite a few years since our last viewing. 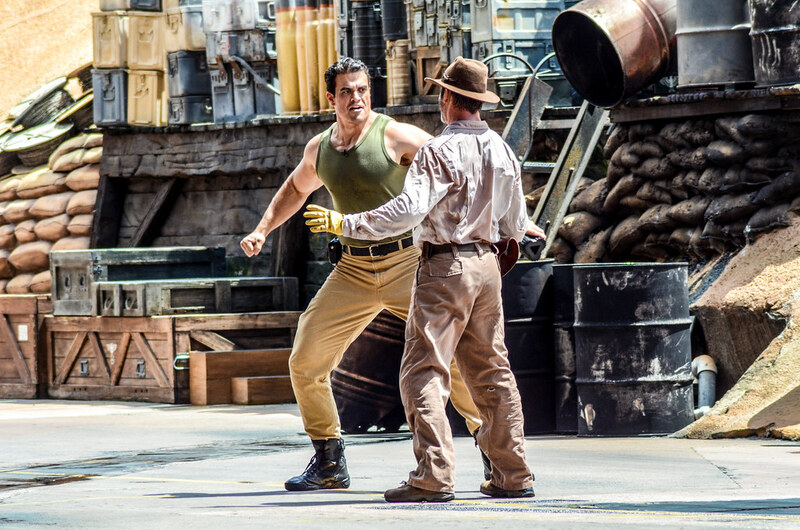 On top of that, I have no idea how much longer Indy will have this space so seeing the show was a priority. 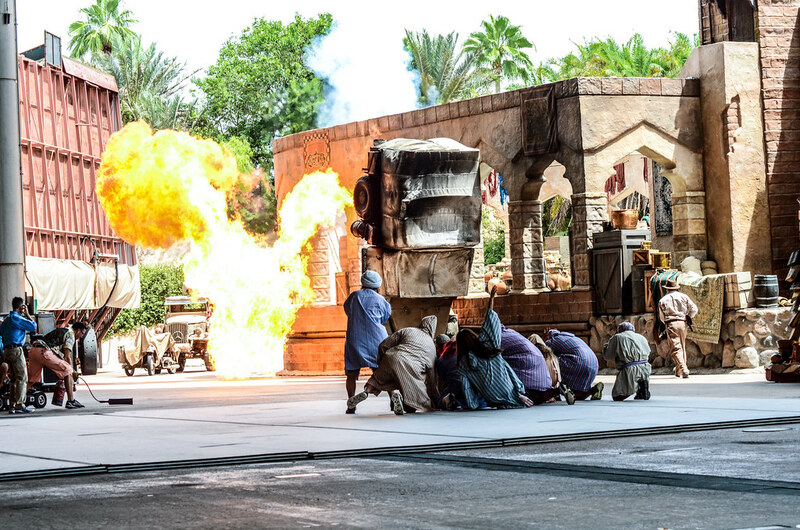 I was pleasantly surprised by Indiana Jones Stunt Spectacular. I don’t remember enjoying the show. While the theme of a working studio filming stunts doesn’t quite fit in with whatever Hollywood Studios is becoming, it’s close enough to have a place in this park moving forward. The Stunt Spectacular could use an update of some sort (maybe a new scene?) it hasn’t aged as poorly as a few other shows in this park. We were lucky enough to sit in the second row on the far side, even though we came in the theater right as the show started. 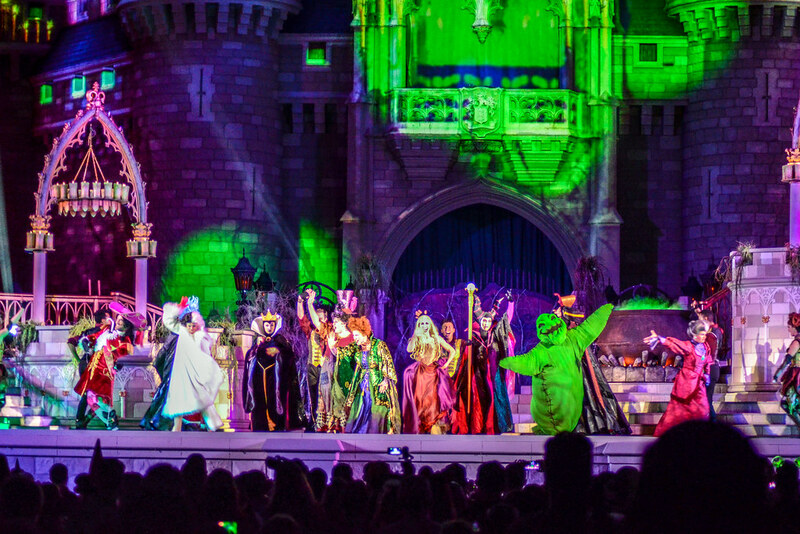 At first we were told that there would only be standing room but once everyone was settled a nice cast member kept finding open spots for everyone. Quality customer service made the show that much better. 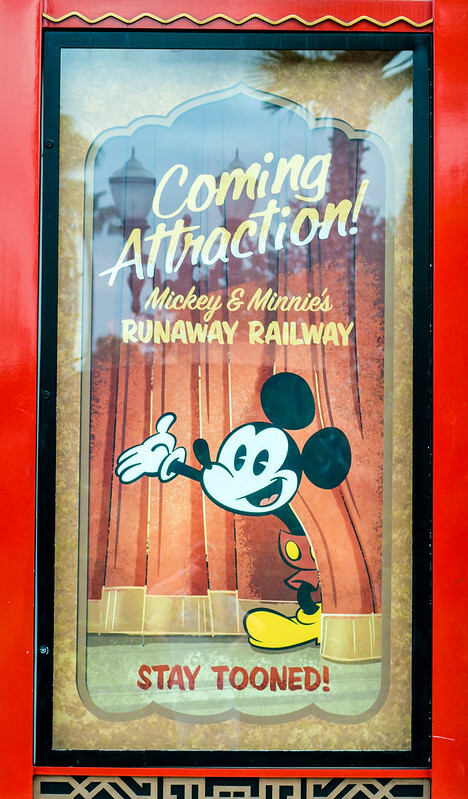 There are ‘coming soon…’ posters all over Hollywood Studios, way more of these posters and construction walls than actual attractions. This is both frustrating in the present and exciting for the future. With that said, we spent about 6 or 7 hours in Hollywood Studios this trip and enjoyed them. 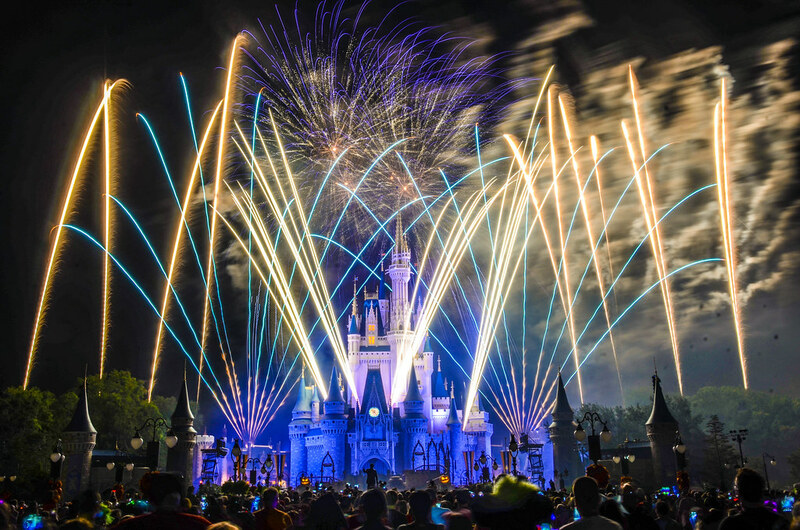 Indy, Disney Movie Magic and the nighttime spectaculars offer a nice base of shows. Tower of Terror, Toy Story Mania and Star Tours (Rock n’ Roller Coaster to a lesser extent) offer a nice base of attractions. Before long Hollywood Studios will be a very good park, just not right now. Mid-afternoon saw us going to check into the Yacht Club. We were headed to the Halloween Party that night and needed to change into our costumes. 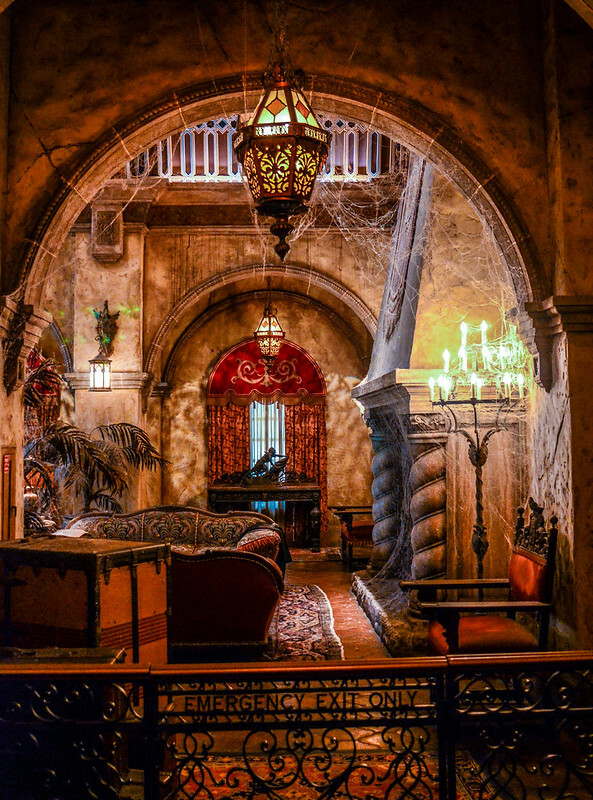 Checking into our hotel was easy and they already had our bags delivered from Coronado Springs. The Yacht Club review is upcoming but I’ll spoil that a little bit. 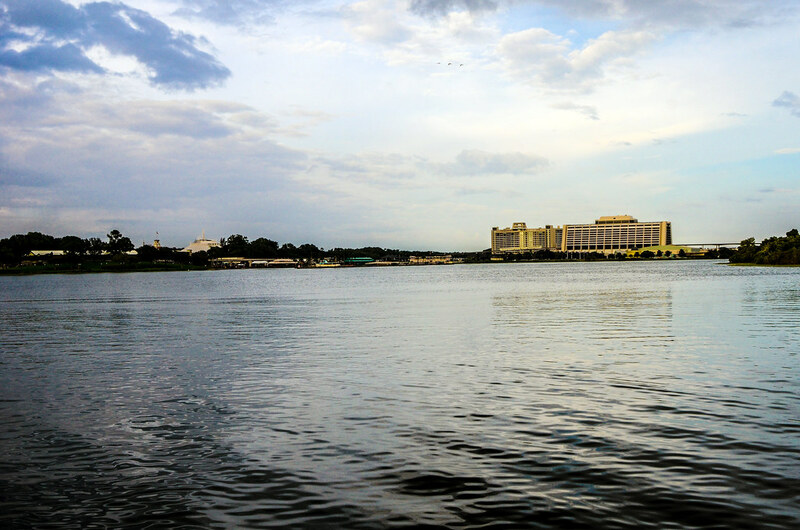 We enjoyed our stay here as much as any hotel at Walt Disney World. After we changed and rested for a few minutes it was time for dinner on the water. 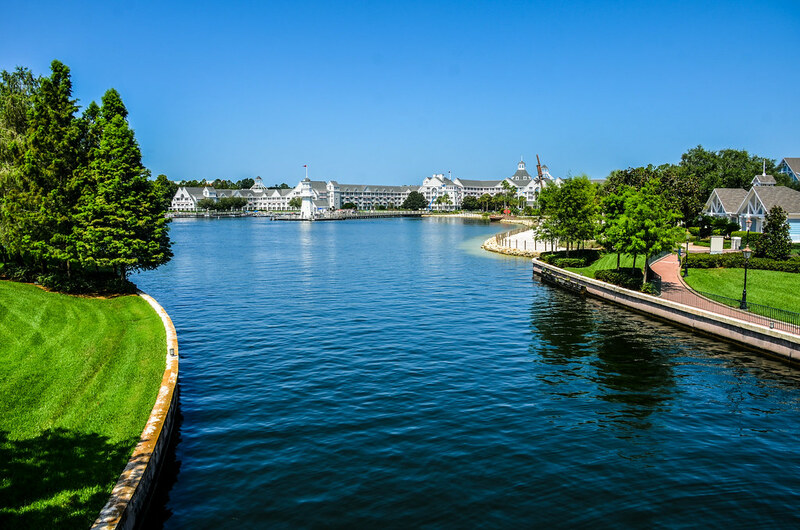 We ate at Narcoossee’s, located at the Grand Floridian Resort. Again, a review is upcoming but our dinner was delicious. Our costumes for the evening were as safari drivers on Kilimanjaro Safaris. We were planning to change into them after dinner where we were just planning to wear shorts and T-shirts. On the way to dinner we realized that the restaurant had a dress code requiring a collared shirt. So, we pulled out these terrible khaki button up shirts that we had for our costumes and put them on. Feeling foolish, we entered the restaurant and were immediately seated at the far corner of Narcoossee’s. Now, they may have just been being nice, seating us at a table right by a window that was somewhat private. But the obvious joke was that the restaurant didn’t want other guests to see our off-putting shirts. I wouldn’t have blamed them if that was the case. We had a few good laughs about it during the meal. We arrived at Mickey’s Not So Scary Halloween Party right around 7. One of my favorite parts of having an annual pass and multiple trips to the Disney Parks is not feeling the excessive need to scrap every bit of value out of park tickets. Feeling that way makes a trip more conducive to doing what you actually want to do. As I mentioned in my review, we always have a great time at the Halloween Party. We started off by seeing Pooh, Piglet, Tigger and Eeyore. 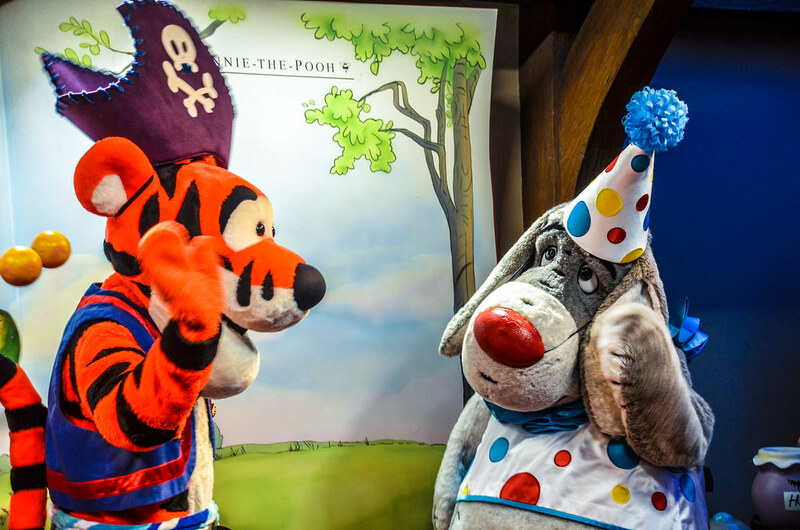 Disney Parks have a few of my favorite items in the world in them and Eeyore dressed as a clown is definitely one of those things. Tigger as a pirate, Pooh as a bee, and Piglet as a butterfly certainly don’t disappoint either. After meeting characters and grabbing some candy we found our spot for the Boo to You Parade. I was very excited to get a spot that had the castle in the background. Unfortunately, I left part of my brain at dinner and decided that long exposure photos would be a good way to go. Truly have no idea what I was thinking that night. This led to about three usable photos and the rest were frustratingly terrible. This parade is a favorite of mine. I’d be lying if I said that this isn’t mostly because of the soundtrack. 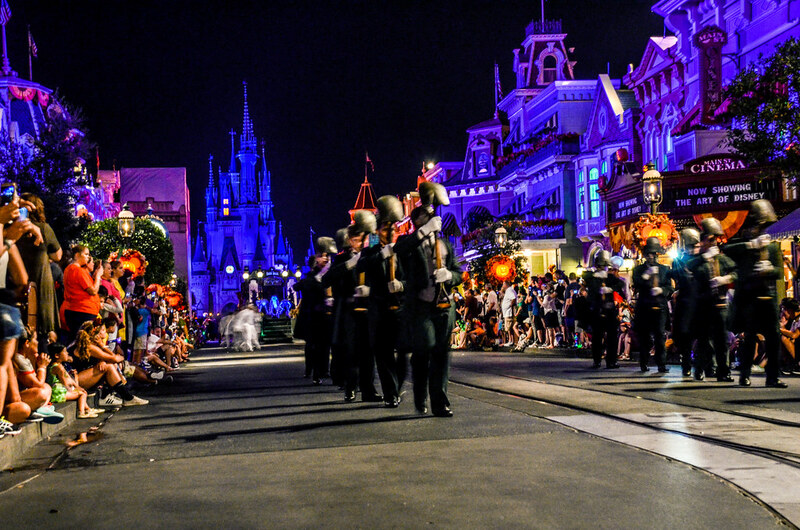 Halloween at our house mainly just means we listen to the parade soundtrack and eat candy. I recommend the same for anyone who is an introvert on Halloween. For as poorly as my parade photography went, HalloWishes made up for it. The colors really popped on the photos and I was very excited about several of the finished products. 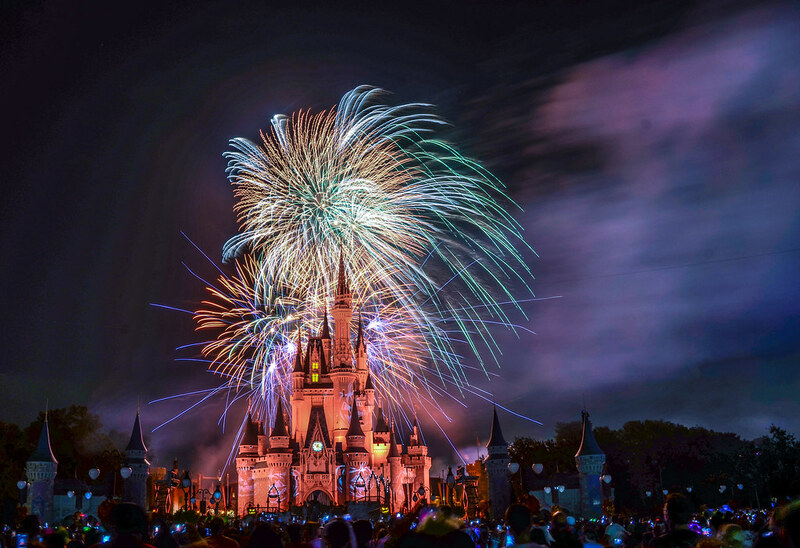 HalloWishes is fantastic. The Winnie the Pooh section along with the Haunted Mansion segment are some of my favorite in any fireworks show. The perimeter bursts are jaw-dropping even if you are watching the show outside of the park. After the fireworks we rode Haunted Mansion, the PeopleMover, did a little more trick or treating and then finished the evening with Hocus Pocus Villain Spectacular. 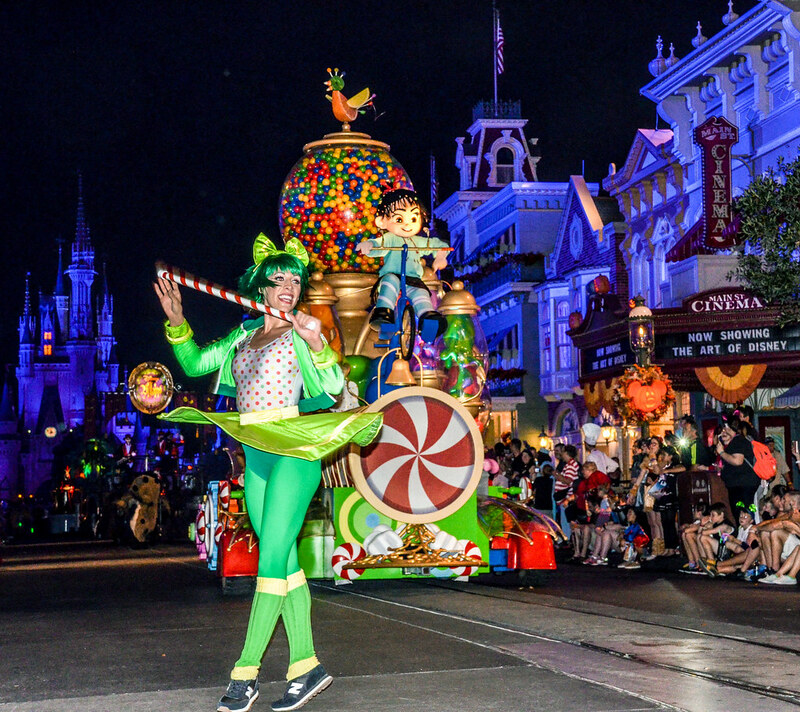 All in all, Mickey’s Not-So-Scary Halloween Party was a blast. Celebrating a holiday that resides a day before November in August was strange. But I’ll take that trade-off in exchange for less crowds. We crawled into bed a little after 1 AM that night satisfied. The next morning brought a few welcome guests! Our sister-in-law and 2 nephews came to visit us, driving all the way from Pensacola. First on the agenda for the day was a trip to Trattoria al Forno, on the Boardwalk, for breakfast. 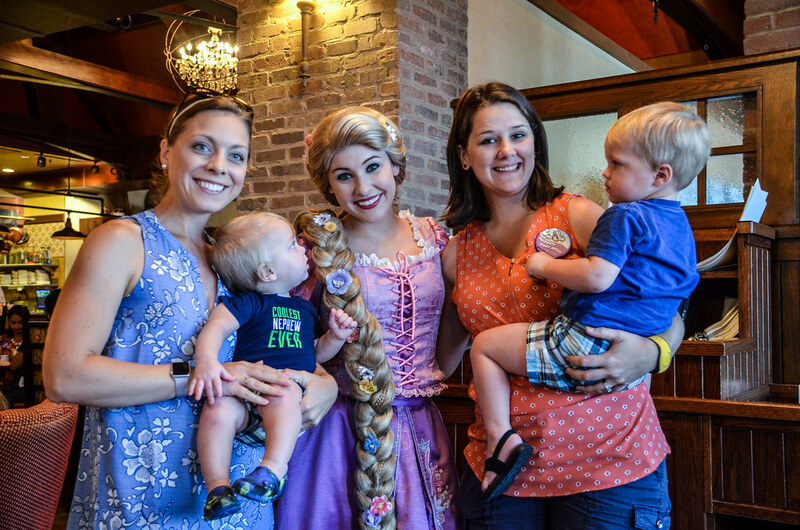 In the past year this restaurant changed a well-regarded breakfast to a character breakfast. We all found the food to be delicious and enjoyed our meal (a full review will be coming shortly). The boys were only slightly concerned about the characters that came to the table, as you can see above. We took a short and hot walk around the Boardwalk, back to our hotel after breakfast. The views are beautiful but it was already getting quite warm for the day. As we found throughout the trip, being out in the sun from 11-5 in August was not preferable in Disney World. There were plenty of ways around this but on this particular day the heat really got to us. After naps were had by all in the hotel room, we hopped on a boat and then took a walk to mini golf at the Swan & Dolphin Hotels. This was my dumbest idea of the trip. Mini golf is great and these courses were a lot of fun. I would highly recommend this to anyone who enjoys this type of thing on a day that you weren’t going into the parks. With that said, don’t make the mistake of going at 2 PM in the afternoon. The boat ride was nice, the walk was miserable outside of the company, and by the time we got to mini golf I was melting faster than the wicked witch. 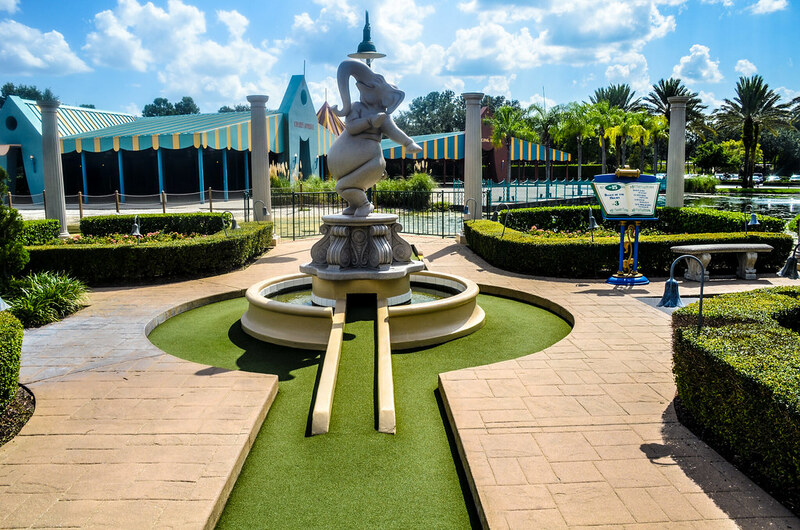 These mini golf courses stay open later than the parks and, if you’re up for it, that’s when I would recommend going. Getting back to your hotel is a small issue if going that route but Uber or the Minnie Vans are always an option. Again, these courses were really cool. This seems like the type of memory that would stick out to some families too; being all together, laughing and enjoying being outside after a day spent all together can be powerful. Just maybe not with a heat index of 110 degrees. As it was, we only played about half of one course before calling it. We had definitely earned a spot in the pool at this point and went there after returning to the hotel. The Yacht Club staff was nice enough to oblige us, knowing that we had day guests with us. They said using one of the side pools would be allowed for all of us. While Stormalong Bay (the Yacht and Beach Club’s flagship pool) would have been preferable, I certainly understand why they don’t allow pool hopping or day guests in there. With two toddlers, the side pool worked out better anyway. After swimming, our visitors bid us adieu and headed out. This was a great way to spend a day and I would highly recommend this to anyone who has family wanting to join them for the day at Disney World. Even if they aren’t going into the parks, there is plenty to see and do. On top of that, it might help you catch up on some rest. The hotel staff was very accommodating in helping us on where to tell our guests to park and anything else we asked. 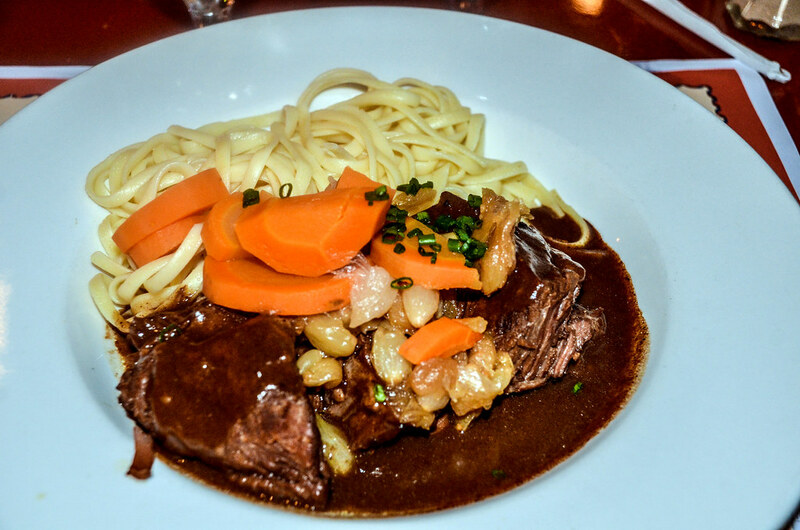 We hustled off for dinner at Les Chefs de France at Epcot. I keep saying this, but another review is forthcoming. 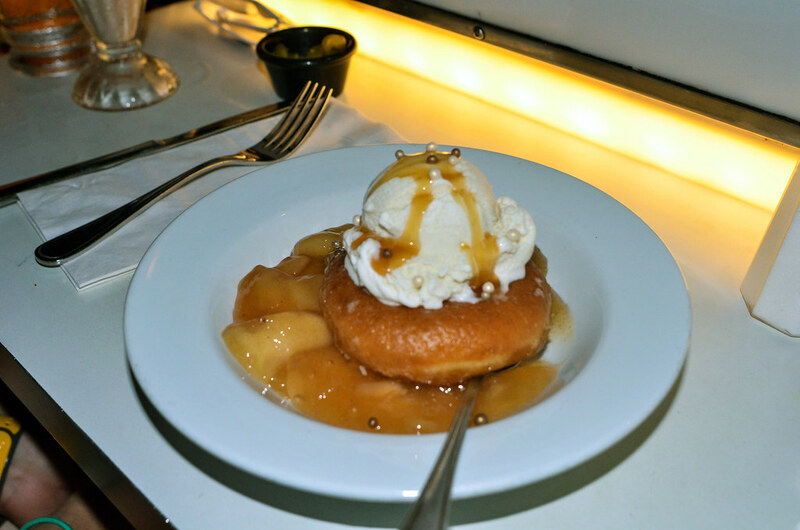 We enjoyed our meal and the leisurely pace of it, relative to other Disney World restaurants. 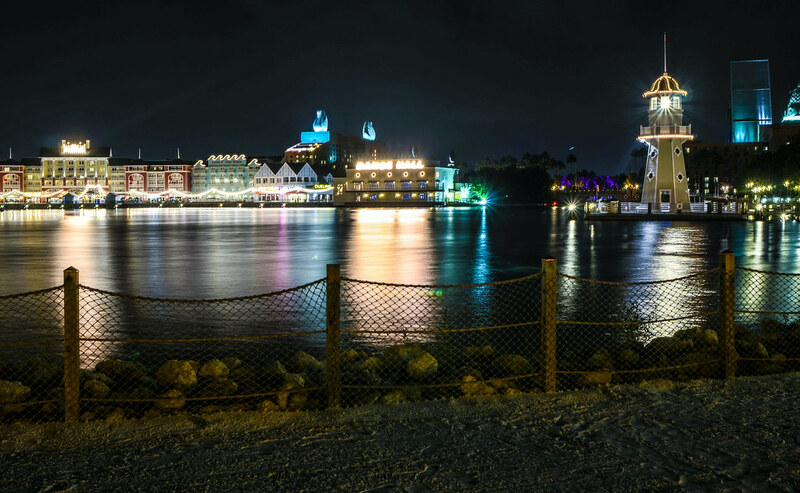 While at dinner we had the tough decision of staying for Illuminations or going back to our hotel to enjoy Stormalong Bay. Seeing how staying at the Yacht Club isn’t often an option for us, we chose the latter and headed back to the hotel. 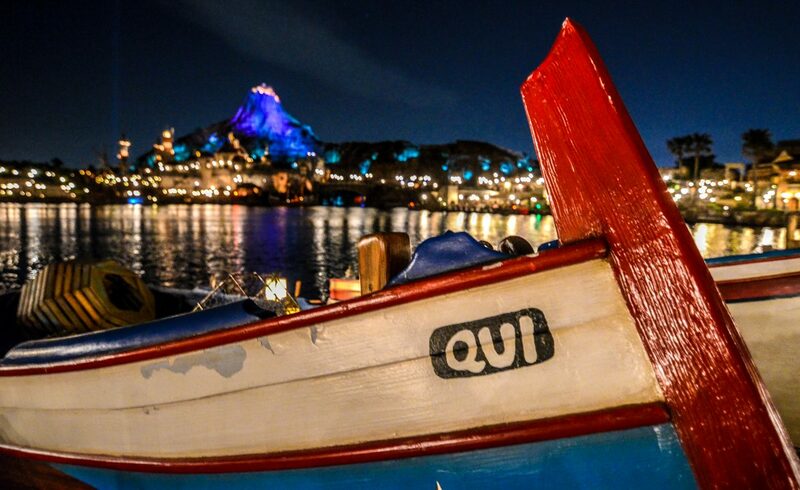 I love Illuminations, but we certainly made the right choice on this night. Stormalong Bay is unrivaled by any hotel pool I’ve ever been to. The location of the Yacht and Beach Club is second to none, in my opinion. 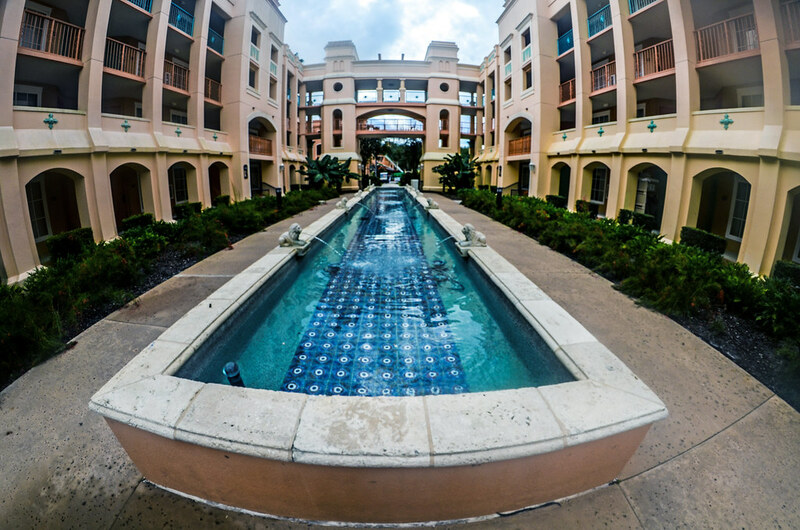 Even with that in mind, the pool might be the best factor the hotel has. I never knew how much I loved sandy pool floors until swimming here. 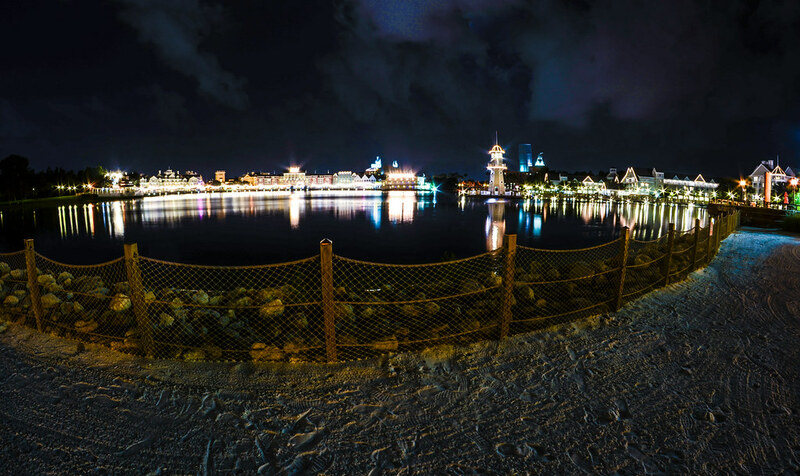 After our night swim, Melissa went to bed and I went to take a few photos of the hotel and Boardwalk. The beach is another nice thing that the hotel has going for it, although it’s better utilized during the day in the winter months. 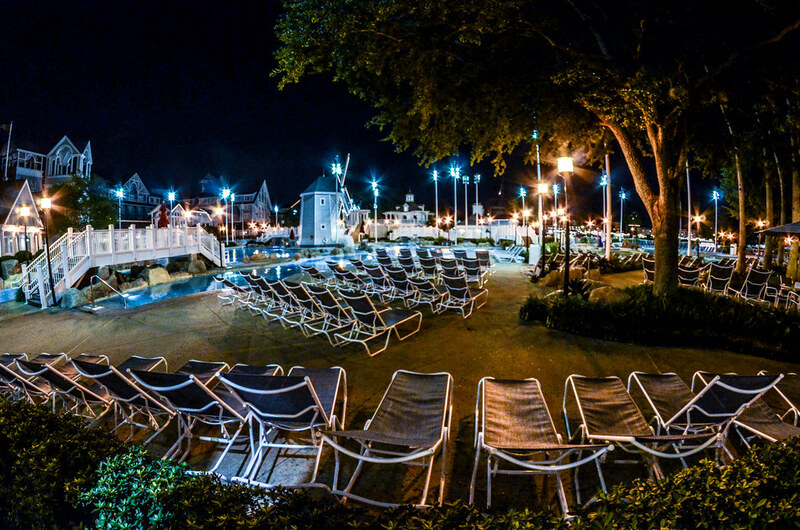 Laying out here at night is quite romantic and one of the quieter places in all of Walt Disney World. This had been a very relaxing day that was conveniently smack in the middle of our trip. Our feet appreciated the rest and we loved seeing family. Having an annual pass and multiple trips in the last year again paid off as we just went into the park for dinner on this day and didn’t feel pressure to stay. If I were a local, I would do that all the time. More adventures awaited and we’ll get to those in the next installment of our trip report! If there’s any questions or thoughts about our trip report (or just anything in general) please leave them below in the comments. Thank you for reading Wandering in Disney, if you enjoy what you’re reading please subscribe to the blog and like our social media pages. You can do both of those things on the right side of this page. Have a great day! 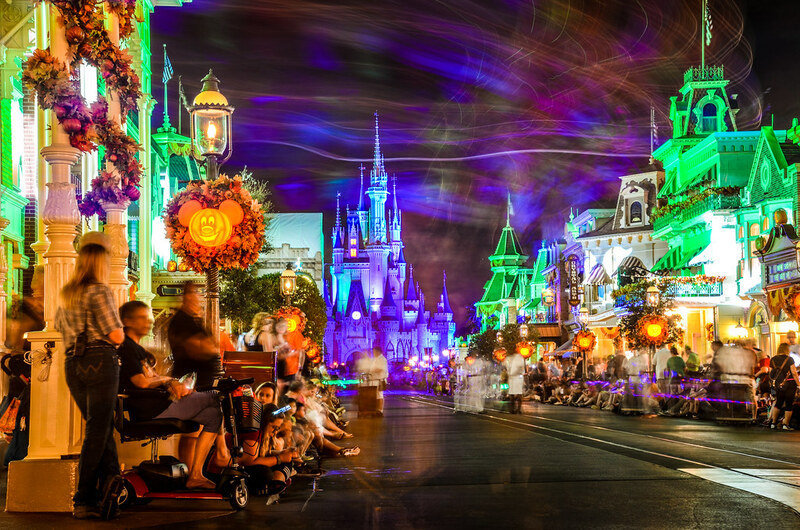 We are hoping to be able to do Mickey’s Not So Scary Halloween Party next year! It looks awesome and delightfully cute! Plus, candy!